YEREVAN—Armenia’s President Serzh Sarkisian was designated as an honorary professor of Peking University, while visiting the University in Beijing on Friday as part of a three-day official visit to China. Sarkisian visited Peking University on Friday as part of his state visit to China and discussed cooperation in education between Armenia and China with the University leaders. Speaking to students and faculty at the University, Sarkisian said the agreements on development of friendly relations between Armenia and China signed Thursday by the leaders of the two countries confirms their readiness to strengthen political dialogue and enhance economic, cultural and educational cooperation. Sarkisian spoke also about Armenia’s foreign policy priorities, its challenges and opportunities. He also focused on rapidly developing Armenian-Chinese relations and prospects for their further strengthening. 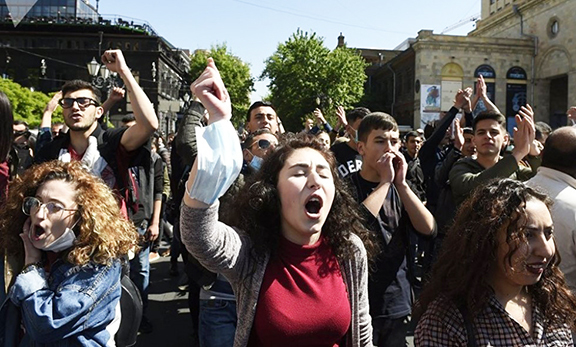 “Armenians have a special respect for China, whose people have carefully preserved their historical civilization, traditions, and heritage for millennia. At the same time, China is an example of a state that has achieved impressive success due to prudent strategy, having taken its rightful place among the leading nations of the world,” said Sarkisian. “We also appreciate highly China’s involvement in the processes taking place in the South Caucasus region”, said Sarkisian. “Cooperation with China in almost all areas is a priority for Armenia. Over the past years we have been feeling the friendly support of the government and people of China. Your country has helped us to overcome socio-economic difficulties of the transition period, contributing to the development of our country,” said Sarkisian. He said the two countries intend to pay special attention to the development of tourism, which will enable the countries peoples to become better acquainted with each other. The first step in this direction will be the establishment of direct flights between Armenia and China, the President said. Sarkisian also spoke about Armenia’s foreign policy, noting that it is aimed at creating an atmosphere of political stability, security, harmony, and economic development in the region. The Armenian President also discussed the Artsakh peace process, relations between Armenia and Turkey, and the approaching centenary of the Armenian genocide. The Chinese have great advantage by flooding the region with cheap useless products. Armenia is willingly become the dumping ground for the Chinese grinding machine. What does Armenia get in return? The decimation of its local manufacturing base, higher unemployment, toxic Chinese products and greater cooperation between Turkey and China. Shining example of the recent weapons deal for HQ-9 air defense missile system sold to Turkey. Europeans and America’s allies are rushing to join the new Chinese-led development bank. So before you lecture Armenia and Armenians about which states it ought to align with, how about you consider the duplicitous policy of Western states in regards to Armenia and other Christian peoples in the Near East. There is no greater way to mangle a name. How and when did we veer so off course that we see it acceptable to publicly display the name of our president, Serge Sarkisian as Serzh Sargsyan?? ?